Do You Support Pill Testing at Music Festivals in NSW? Situated on the NSW Mid North Coast, the Myall Lakes electorate covers more than 5,020 sq km and had a total count of 50,000 voters at the 2015 Election. 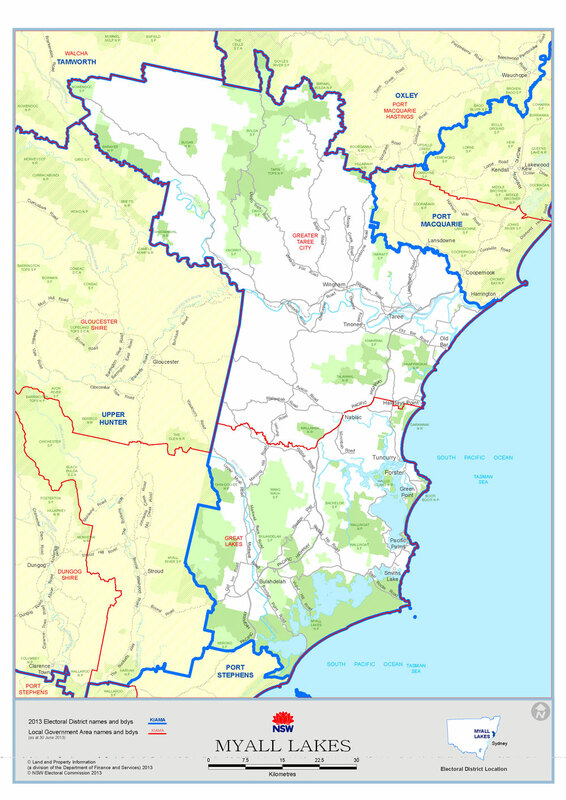 Major towns and locations in the Myall Lakes electorate include Blackhead, Blueys Beach, Bobin, Boomerang Beach, Bulahdelah, Burrell Creek, Coomba Park, Coolongolook, Cundletown, Diamond Beach, Dyers Crossing, Elands, Forster, Hallidays Point, Killabakh, Kimbriki, Krambach, Manning Point, Marlee, Mitchells Island, Mount George, Nabiac, Nerong, Old Bar, Oxley Island, Smiths Lake, Taree, Tinonee, Tuncurry, Wherrol Flat and Wingham. Myall Lakes is one of the fastest-growing areas in New South Wales. Projections for Myall Lakes have the population of the electorate increasing 45 per cent by the year 2031. The electorate is situated on the Mid North Coast and stretches from south of Bulahdelah, to the Coopernook bridge in the north, almost to Nowendoc in the west, and the most perfect coastline to the east. Myall Lakes is unique, with approximately 200 kilometres of stunning coastline and the mighty Manning River meandering from the mountains to the sea. It is the only double delta system in the southern hemisphere with its numerous islands. It has 156 kilometres of navigable waterways. The Great Lakes region, consisting of the impressive Wallis, Smiths and Myall Lakes networks, makes the Great Lakes region, together with the Manning River, the New South Wales water playground. Myall Lakes has two major commercial centres, Taree and the twin towns of Forster-Tuncurry, together with numerous towns and villages—all unique—making for a wonderful environment in which to live. Myall Lakes is not just about beaches and boating; we also have the rural hinterland only minutes from those fabulous beaches. Tourism is extremely important to the electorate, but so too are the primary and agricultural industries. We have it all: beef, dairy, chickens, pigs, fish, oysters, timber, deer, alpacas, avocados, kiwifruits, etc. It is an area where the sun always shines and the sky is always blue — even on a rainy day, the ocean is blue. The State Electoral District of Myall Lakes has been held by The Nationals since its creation in 1988. Myall Lakes’ major industries are agriculture, aquaculture and tourism. Authorised by Stephen Bromhead MP, Produced using Parliamentary entitlements.